Facebook users can now choose to stream video only to members of closed groups or events, the company announced on Wednesday. This crucially allows broadcasters to limit their audience outside of their circle of friends, making it a more viable tool for for semiprivate events —for instance, a band might share a live backstage stream with only its fan club. 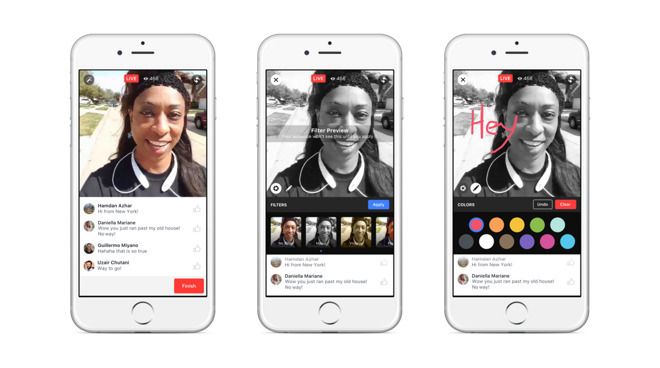 Broadcasters will also gain new Snapchat-like live video filters and the ability to annotate their streams with drawings in realtime. Those watching the stream have new options for interactivity as well. Viewers can react to streams just as they can to a typical Facebook post, and replayed streams will also replay reactions and comments. For discoverability, Facebook has added new tools to allow viewers to invite their friends to watch the same stream. In addition, a new dedicated discovery section will let viewers browse every public stream —on the desktop, this will take the form of an animated world map. Facebook is the second social networking giant to announce a streaming video update in as many days. Realtime competitor Twitter on Tuesday won the rights to stream Thursday night NFL games during the 2016 season.